The BlueBird has left the nest. With all of my resources going into the wrecker the BlueBird was being neglected, I finally decided it was time to let it go. It left tonight with it's new owner and regretfully it sounded especially good as it drove away. I hope the new owner and his family enjoy it as much as I did. Farewell ol' friend. 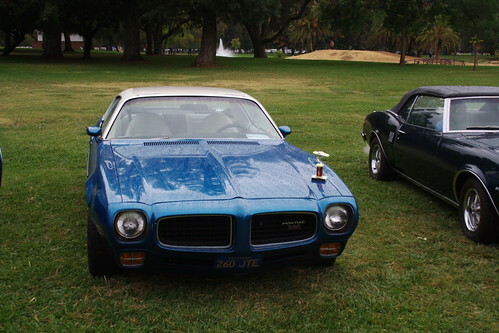 Biggest turnout of Firebirds I've seen in the SF Bay area, by my count we had 23. Official photos will be released by the show you can check this link. More groups are pasting their photos on facebook. 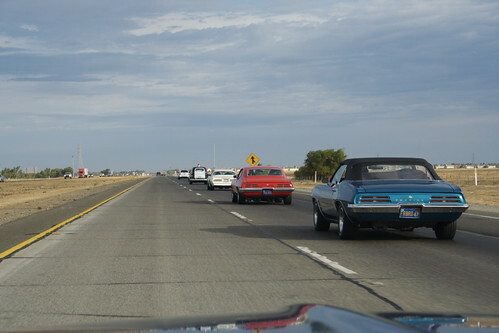 I had a blast taking the Bluebird out with a bunch of other second-gen Firebirds. We started at GM Sports in San Jose, hit Kassabian's in Dublin/Pleasanton and trecked up to Modesto for the Graffitti Car Show. Thanks for an awesome cruise this year! We outdid ourselves with 20 cars this year compared to 8 last year. Please mark your calender for the second Saturday in June, 2012, and plan on joining us again. I am still going through all of the photo's we took. If you have some noteworthy shots you'd like to share please forward them so I can share them with the group. I plan on sending an album out by next weekend. 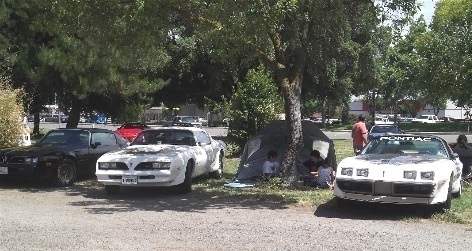 A big HUGE THANK YOU to the car show coordinators and the Kiwanis Club of Modesto for allowing us to park our precious Trans Ams in a secure area! We all really appreciate that and your event was outstanding as usual!!! "This is sheriff Buford T. Justice. I'm in pursuit of a black Trans Am. He's all mine so stay outta the way." The Bluebird gets some interior work. 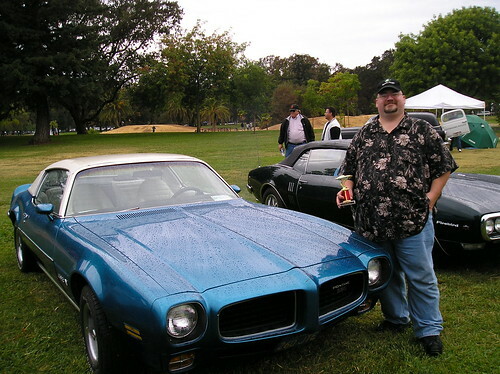 When I purchased the Bluebird a 1973 Firebird 350, it had some after-market items in it that were no longer functioning. The console mounted Stewart Warner Tach always read 1500rpm, the aftermarket cruise control was dead, the trip computer didn't talk to the fuel senders anymore, and the digital temp, oil, and voltmeter was on the fritz. 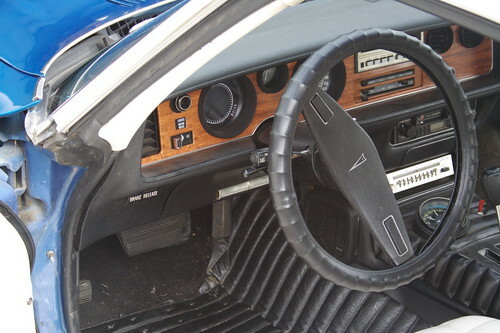 The trip computer was mounted in the original dash bezel, removing it left a big square hole. Likewise for the tach and the temp, oil, volt meter in the center console. 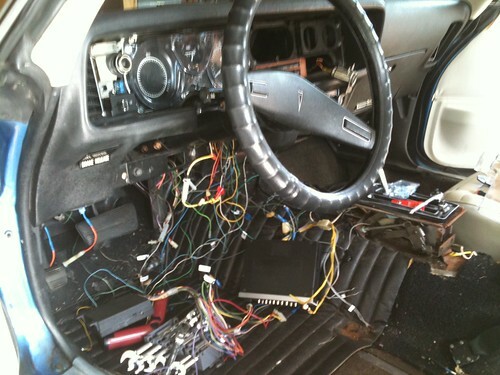 The radio install had been done in the map tray, and the wires run through holes drilled through the map tray. I got a new reproduction console from Ames Performance http://amesperformance.com/. I also got a 1970-81 Stereo Map Pocket Adapter http://www.78ta.com/store/product.php?productid=168&cat=27&page=1 from Hitman's site to use with the reproduction console and replace the modified map tray. I must admit that the Map Pocket Adapter didn't match up to the reproduction console as well as I think It would have fit an original console. I fidgeted enough with it to get it installed decently. I also found a replacement dash bezel on ebay. 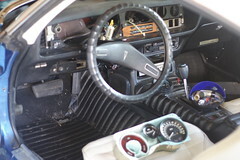 Once I had the center console out, removed all of the wiring associated with the cruise control I found that the Accessory fuse had been popped. Perhaps thats why on the last trip my GPS didn't work in the cigarette lighter socket. 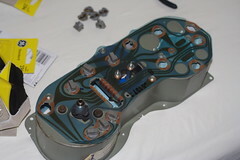 I began removing all of the unneeded wiring and trying to chase down the dead short I had somewhere. I finally chased the problem down to the cigarette lighter. The tabs on the inside that push the lighter out when it's ready had become fused to the inside of the socket. I ordered a replacment from Ames Performance. The replacement came with the socket and shroud; except the shroud didn't have the support for the extra light that was original to my current socket. I realized I could take the shroud off of my original, drill a hole in the side of the new socket to allow light into the replacement and re-assemble it. Worked like a charm. No longer blowing the fuse, and the light in the cigarette lighter still works. 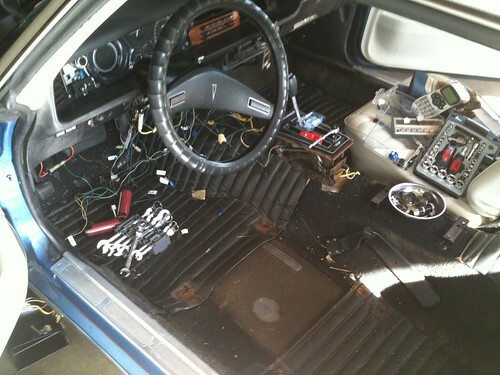 This is the interior of the car before all of the work. This is a shot of it after. The Bluebird takes home a trophy. 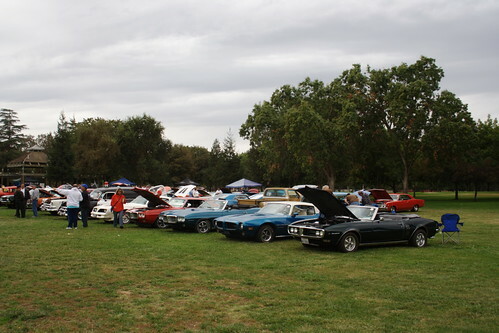 The Bay Area Firebirds (BAFGFB) group organized a cruise up to the Muscle Cars in the Park 2010 show in Elk Grove, CA. 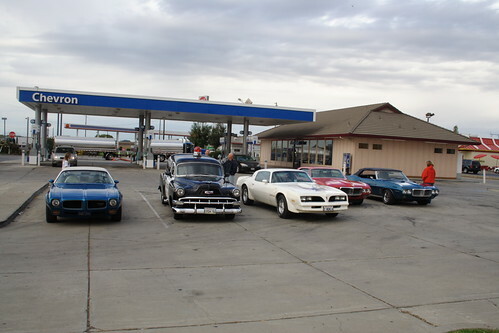 With a stop in Flag City to group up before making our way to Elk Grove. On the way to Elk Grove. My best guess it's a lark, because Lisa's white 78 should have been in the same group and was clearly a better car, and didn't walk away with a trophy. I had a great time despite it being a little wet. Last weekends project was re-opening the dash to fix all of the instrument panel lights, and figure out why the fuel gauge was stuck. Using the service manuals I was able to verify the resistance at the tank, and was able to test it at the wiring harness. So the problem seemed to be the gauge itself. I rigged up some leads to a 12v DC power supply and tested running a current through the gauge, I managed to make it move, so I figured I'd try putting everything back together and see if it works. I replaced all thirteen lamps in the instrument panel, and discovered one defective socket. Luckily my parts store had one of the sockets in stock. I re-assembled everything, and then took a victory ride, with some pictures along the way at my favorite spot to show off the updated rims and tires. So far so good with the fuel gauge. Repainting my Rally II's. -- Done. After 3 coats of Duplicolor Self Etching Primer (DAP 1690), and 2 light coats and a med coat of Duplicolor High Performance Silver Wheel Coating (WP 101). * see notes about colors later. This is also where things start going awry. I had purchased the 14" Rally II Mask Kit from Ames, which turned out to be a waste in effort and quality. They are essentially a material that's consistent with shipping labels, they came on a sheet as peel and sticks. The mask makes no provisions for masking the small 1/4" ring that surrounds the parts that will be charcoal on the face of the rim. I had "Assumed" the mask kit, was a complete mask. Not so. The "stick" part of the mask was also a lie. It didn't stick well, as you can see in this photo. It will come into play later. I went out looking for some 3m pinstriping tape to try to mask off the areas that the Ames mask didn't cover; couldn't find any with my local loop of Monument Auto Parts, Autozone, OSH, Lowes... I settled on the Automotive masking tape you see in the photo below. The auto masking tape $4.99 worked better than the mask kit. I could put it down, there is a small ridge between in what would be the charcoal sections, pressing my thumbnail into the depression made a crisp crease, that I could then use as a guide with my pocket knife to cut away the masking tape leaving a nice edge as the mask. I knew at this point I should rip off the stupid mask kit and just use the masking tape for the spokes. But I ignored my common sense and stubbornly moved forward. Damnit I paid for them I'm going to use them. Not shown but there's also the problem of masking the wheel sides, after failed attempts to use a larger 3m masking tape, it just did not want to flex in a circle without coming off the wheel, I crafted a piece of corrugated cardboard into a cylinder that fit over the masking tape in the groove between the wheel face and wheel rim. The only downside to this, was the corrugated cardboard with an uneven cut left room for a little bit of the charcoal to over-spray into the void which I later had to touch up with the silver paint. 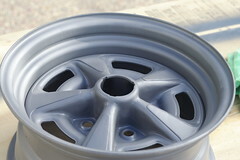 The darker color is Duplicolor WP102 Graphite. While painting the graphite color, just as I made a the final pass, one of the stupid mask labels popped up, and I covered the tip of one of the spokes in graphite. 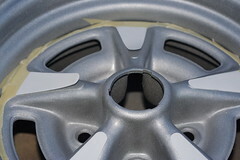 After some expletives, I decided the wheels had enough coats of the graphite color and called it quits. Once the wheels were dry, I sprayed some of the silver onto a piece of cardboard until it pooled, and I used a craft paintbrush to cover up the graphite over-spray on the spoke that had popped up. 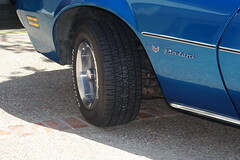 When I had ordered the mask kit from Ames I also asked about the red Pontiac insert in the center wheel caps. They didn't have a record of a part number for it. I asked about the entire center cap, and apparently its been discontinued. To make mine red again I used a red sharpie ($0.95), that I spotted as I was checking out after buying some tools at OSH. Now, about the colors. Despite being armed with known good Duplicolor Paint Numbers that would match the original OEM paints, Nobody locally had them in stock. To order them online would have meant waiting at least five to seven days for them to come via ground. I settled on the Duplicolor paints above because they were, in stock, close enough to the hues I was after, and I was willing to sacrifice correctness for getting the wheels painted and having the car off the jack stands by the following weekend when my dad comes to visit. A rolling running car is a lot more interesting than one on Jackstands. And ultimately my plan is to replace the wheels anyway with some 18x8". So they just needed to look decent, I didn't need correct. A Pontiac enthusiast will immediately be able to detect that these paints are highly metallic and the graphite is not a dark charcoal, and they are most certainly not correct. But they do look good. I am not an expert, and certainly won't be winning any concourse awards for my handiwork, but I'll give you the benefit of my limited wheel painting experience. If I were to do this again, I would definitely have them sandblasted, I tried cleaning them with a 2000 psi power-washer, which was a waste of time, have them blasted. 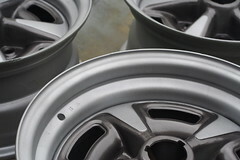 I used Maas Bros Powder Coating, and I found that if I had allotted enough time for them to do it, they could have powder coated the wheels in the correct Silver/Argent for $50/wheel. 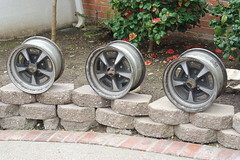 I thought that was expensive at the time, but considering it took me from 6am to 9pm, and a couple hours the next day to prep, prime, and paint these wheels it now seems like a bargain. Do it indoors if you can, I did mine outdoors, and I had to pick out debris that was blown in from the trees. (It's also easier to paint by light if you are indoors) I on the other hand was outside at 9pm when it was pitch dark with my LED headlamp and work-light painting a dark graphite color. Just mask them yourselves, and don't use the stupid tape with plastic dropcloth that you can buy at OSH it will not stick, or it'll stick to itself, trust me, just throw it away it'll cause you less frustration there. Mask it with auto-masking tape and newspaper and keep your sanity, don't bother with the silly mailing label masks. If I were to do my cylinder column again, I would use a posterboard, and cut it very accurately. 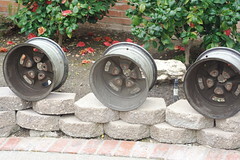 I'd also cut one for each wheel, because using only one form for all wheels it began accumulating paint on the form, and was about to start to run paint down into the work area. You only need a cylinder about 5" tall, any taller then it starts making the only angle you can spray the paint, almost straight down. Oh which brings me to my last annoyance. 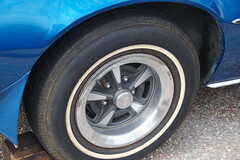 When I remounted my wheels and was going on my first test drive, something was rubbing, majorly. It turns out that the new way to balance a tire is to install these flat lead weights that are mounted on double sticky tape on the inside of the wheel. WTF?! And they were hitting my brake calipers on the front. I dismounted the wheels and had to cut them out. I've got to drive it to the shop that did the balancing and make them do it again on all wheels to make sure I can rotate the tires. My last lesson learned so far: The valve stems are too short once the chrome covers go on, I guess I should have known this and made sure the shop put on longer ones. Shouldn't the shop have known this? They are common wheels, they knew exactly what kind of car I had even if they couldn't see it. 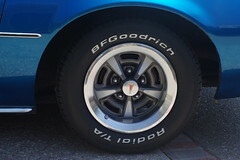 But the wheels and that BFG rubber, look good; so in the end, it'll have been worth it. The Blubird is now on blocks. It's time to restore the wheels and wrap them is some proper rubber. While I've got it up on the stands I'll be replacing the shocks, all of the fan belts, oil pan gasket, and I'm going to attempt to replace the main rear seal. Quick note on the placement of the jack, even though its on jackstands, a number of people suggested leaving the jack in place in case of a stand failure, at least you would have some secondary protection. So I've got the cars jack at the front and the floor jack under the rear, just touching not actually lifting. It's quite stable on the jacks by themselves. Another suggestion that I used was to give the car a decent test in all directions, give it a good shove. If it's going to fall down, you'd rather have it happen on your terms than when your under it. It's not a time to be gentle, you want to be confident the car isn't going to shift, or that your jacks or stands are only barely keeping it up. I managed to get two lugnuts off by using the t-bar, but got stymied by the rest of them. I decided it was time to spend some money instead of wasting the braun. I briefly considered that it might be time for an air compressor setup, as I tallied up how much it was going to cost to get a unit that would actually do everything I wanted I decided it wasn't yet time to splurge. So off on my circuit to find an electric Impact wrench. Lowes, Monument Auto Parts, Autozone, Orchard Supply Hardware then Home Depot. Lowes had a DeWalt, Monument nothing, Autozone Nothing, Osh had a crappy looking green Hitachi, that was $69 bucks, Home Depot had the same DeWalt as Lowes and at the same price. I paid $179. I know it was a lot more than the Hitachi, but I just don't know the quality of the Hitachi, the ultra green didn't do it any favors. 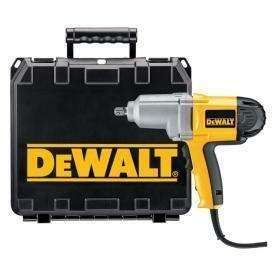 DeWalt is at least a name I trust, though I would have preferred a Millwaukee, but nobody had one. In any case the DeWalt whipped those lug-nuts right off, This is a tool that I think I'm going to get a LOT of use out of. I need to mail order some impact extensions, I could only find two sets of impact sockets at Lowes, I bought the SAE, I'll buy the metric if I ever have occasion to need it. Lowes didn't carry any of the extensions or any other accessories for Impact wrenches except in a kit, that included an air impact gun. I had to jerry rig the gun to accept one of my socket 1/2" extensions. Probably not wise but it got the job done. I'm getting frustrated by having to do the circuit each time I need something and having to settle for whats in stock. I'm going to start trying to buy more online so I can get exactly what I want and don't have to settle for just whats in stock locally. I bought a pressure washer this weekend to help clean up the wheels, but I'm still pretty certain I'll have to have them blasted. I'm just hoping that if I clean them up well with the pressure washer, then they will need to spend less time blasting them. I'm hoping the pressure washer will help out with a number of car cleanup projects as well as around the outside of the house chores. I didn't get a chance to play with the pressure washer this weekend though as I spent Sunday assembling my new Gas Grill... and then it promptly rained so we couldn't use it either. Hopefully I'll get to play with both next weekend. I took off the formed mud flaps, that the previous owner had added. You can see them in the pics below. Fixed the sagging door, and retrieved my Iphone from the belly of the beast. So I was in the second week of the "fix the sagging door" project. I rigged up some 16ft ratcheting tie downs to the bracing of the garage to support the door. This system worked really well, giving me granular control over the door while it was off. I don't know how I could have fixed the door by myself without this rig. You can see the door off of the car and being supported by the tie downs, which kept it vertical and in a position that could be easily maneuvered back into place. I also needed a door spring compressor, I got mine from Summit Racing, http://www.summitracing.com/parts/TTN-15040/, It's absolutely worth the 10 bucks, you'll spend more than that in frustration if you try to use a screwdriver. (I also wore eye protection). During the measurement attempt, where I had precarious hold of the phone, it slipped out of my grasp, skittered down the backside of the fender, and disappeared into a crevasse under the body of the car. 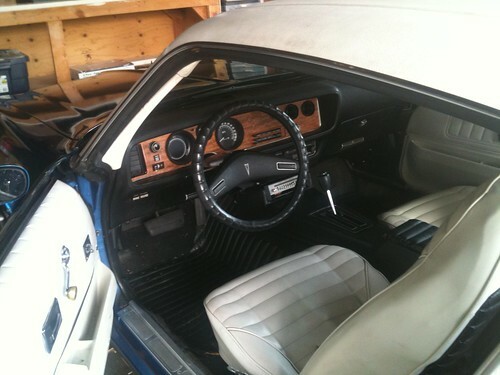 After some encouragement and a couple of ideas to extricate the Iphone without taking the entire front end of the car apart from my friends on http://groups.google.com/group/FirstGenFirebirds; I went back to work. I ended up taking off the formed mudflaps that the previous owner put on, I was going to remove them eventually anyway. Removed the two main bolts on the underside of the fender, then three of the fender well bolts. Once I had that done, I could pry the fender to splay the opening out a little bit, then using the mallet-coax technique that was suggested I could move the phone closer to the exit I had opened up. Victory! It had a few extra scratches in it, but it was otherwise in working order. Make note, when working with precarious grip, in tight situations, tie a string to your tool, just in case. It could save you hours of work. Big props to the FirstGenFirebirds list for recommending the Flex GearWrenches. http://www.gearwrench.com/catalog/wrenches/ratcheting/flex_combination/setdetails.jsp?part=9701 I have a good compliment of sockets, and socket accessories. But I'm finding that these GearWrenches are so much easier and faster to use, getting into places that would be next to impossible for a socket set. If you use tools, you owe it to yourself to at least pickup a small set and try them out. Lowes, carries them, thats where I bought my set. I'll be buying more GearWrenches.